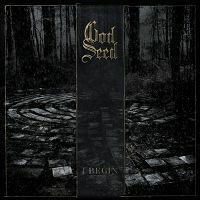 Despite Gaahl’s announced ‘retirement’ a few years ago, few believed he and King Ov Hell would not reconvene and put out an actual God Seed studio album, and – despite some very real missteps – I am (mostly) glad they have. Welcomed, swirling guitars of blackness greet the ears from the very first moment of opener ‘Awake’, assembling a perfect groundwork for Gaahl’s low-high, raked throat howls that still carry a forceful menace to them few BM vocalists can match. Thrashy, Infernus-like tempo changes follow, and thereafter a cautious ‘so far, so good’ feeling arises … then, two minutes in, the awkward keyboards that sprinkle the album rear their unnecessary head. While most of I Begin‘s ebony/ivory fingerings are of the ’70s progressive rock variety and aren’t too grating, the Addams Family nature of those very first synth melodies are definitely so, and would make more sense on a Halloween party cd than on any serious work of Black Metal. Happily the notes disappear quickly and attention can be returned to the coldness we’ve come here for. Besides the tritones, traditional metal arrangements also scatter across the God Seed soundscape, distancing them even further from their Gorgoroth alma mater. The bass guitar-rumbling ebb and flow of ‘Alt Liv’ embraces Heavy Metal and an unusual, almost industrial aesthetic, employing digital embellishments enmeshed with bombastic, ‘loud’ guitar sections – all of which promise to alienate the few BM purists who’d even bother checking I Begin out at all. Here, again, I feel the synth work (courtesy Geir Bratland of Dimmu Borgir/Satyricon fame) to be superfluous, but the experiments in sound taken as a whole remain interesting, although these experiments in ‘Alt Liv’, arm-in-arm with the many-layered vocal tracks and effects-heavy spoken passages, leave me wondering if Gaahl and King have been listening to a lot of old Rammstein. Luckily, when done to accent vocals, God Seed’s electronic choices don’t feel too out of place. Gaahl’s tasteful, cleanly-sung chorus work on ‘Hinstu Dagar’, for example, justifies the occult-rock organs accompanying it, but elsewhere in the song these sounds simply annoy without his vocalizations. Bratland’s playing resonates more effectively in songs like ‘Lit’, wherein his warbling contributions fall somewhere nicely between Kansas and Aldo Nova. The more prominent, traditional metal riffing/writing arises again on ‘The Wound’, with god-sized power chords and a classic metal drum pattern certain to appease old-schoolers (brought a smile to my face!). Gaahl’s tortured screams and Kenneth Kapstad’s blast beats in the final moments help keep the song BM enough to not fall prey to becoming a pure retrofest, however. This entry was posted on October 30, 2012 at 7:00 pm and is filed under ALL REVIEWS, G-reviews.You can follow any responses to this entry through the RSS 2.0 feed.You can leave a response, or trackback from your own site.